Annihilation of nations? what will that look like, exactly? – What's Up With Francis-Church? Annihilation of nations? what will that look like, exactly? Despite their obvious seriousness, their great import, it is still true that some of Our Lady’s warnings at Fatima remain somewhat mysterious. Right now, we can look just at the warnings that were about what would happen if the consecration of Russia didn’t happen. For instance, what exactly did she mean by “annihilation of nations”? Now I’ve had a few ideas pop into the old brain, and I’m just putting them out here for some consideration. I’m about as far from a Fatima expert as can be, and I’m really just thinking out loud here, so feel free to get into it with me, or throw out your own ideas. The other day I posted a video of our friend Brian McCall talking about this phrase and its relation to abortion. Of course, he’s quite correct. The last time I looked it up they were doing about 50 million a year around the world. That’s 50 million people killed every year, totally innocent of any kind of wrongdoing, with no means of self defence, and no one defending them. In sheer numbers, that’s the populations of whole nations, every year. There are 60 million people in Italy right now, or thereabouts. It’s one and a half Canada’s every year. This is perhaps a legitimate way of looking at the “annihilation of nations” thing, perhaps. Certainly the proliferation of abortion as a keystone of the Sexual Revolution is a product ultimately of the “errors of Russia.” So that also fits. And I guess when people who are interested in Fatima talk about it, that’s what they talk about most often, and rightly so. Still, I think there are one or two other points that could be made about the current situation that still have a strong connection to the “errors of Russia” theme. But these other things that are going on right now don’t pertain quite so directly to abortion. Of course, this child of the Cold War isn’t ever going to forget the most obvious. Nations, in the sense of geopolitical, legal entities could be wiped out at the turn of a key, as we have known all our lives. What is happening to the unique nations of the world? How English are the English these days? What about the Germans, the Italians, the Spaniards…? I’m thinking about homogenization, cultural erosion on a global scale. It’s called “Westernization” in places like Japan and Korea. In Europe we call it globalization. Pundits sometimes call it Disnification. But it all amounts to the same idea: the same-ification of the whole world. I just remember the time my Auntie Gill and I went shopping in Chester some years ago, a beautiful medieval/Roman market town, for presents for the kids, my cousins, at Christmas. I wanted to get some Winnie the Pooh stuff for the youngest, Ben. There was loads… all of it the American, Disney version. EH Shepard’s drawings were nowhere to be seen, and none of the shop people had any idea what I was talking about. And we know that “national identity crisis” is the kind of cultural assault perpetrated quite deliberately by the people running the show to grind down a nation’s sense of self. It’s what Pierre Trudeau (on orders, no doubt, from his puppet master, Lester Pearson, Maurice Strong and God only knows who else) did to Canada. Until the Trudeau revolution, that coincided, btw, with the anti-Catholic, secularist cultural pogrom in Quebec that we now know as the “Quiet Revolution,” Canada knew fine well who we were. We were the proud colonial English, Scottish and French synthesis, the grand success story of peace, order and good government, a great and prosperous, peaceful jewel in the crown of the Empire, ready to fight tyranny ferociously for the mother country. And what has been the source of this cultural dissolution, the corrosion of the cultural uniqueness of nearly all nations that the “West” has touched in the last century? All the nations of the world are slowly being sucked into the great maw of “Westernized,” “globalized,” post-industrial, Buzzfeedified, culturally-marxified sameness. Take just one aspect, one of the most essential; launguage. The 20th/21st century has seen the exponential increase in what anthropologists call “language death”. Even the lightweights at Ted talks have figured this out. “Political correctness” (the polite term for cultural or Gramsciist Marxism, voluntary self-censorship) has helped a great deal. We see many news articles in Britain describing, for instance, “British girls” running off to join ISIS. But in what sense is a Muslim girl, born of Pakistani parents, raised speaking Urdu, attending a school with 80% Pakistani Muslim pupils, completely bubbled-off from British culture… “British”? The Swedes are almost legally obliged to refer to their Islamic invaders as “New Swedes,” perhaps one of the more obvious examples of this increasingly heavy handed, anti-cultural imperialism. 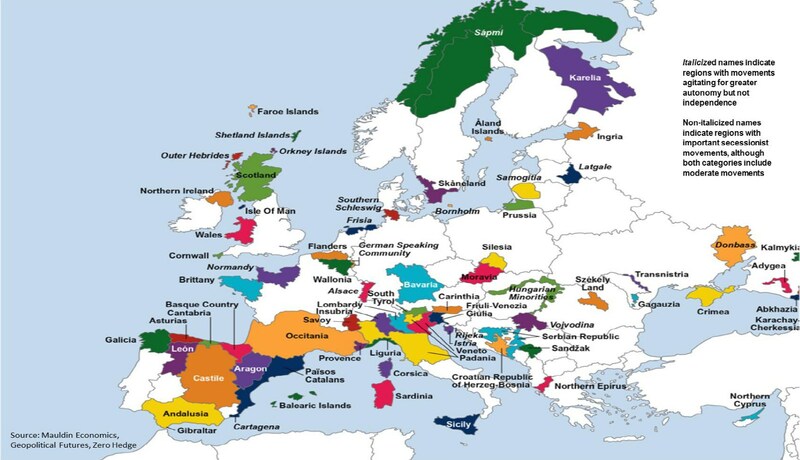 The European Secessionist map. These are all the regions – many of which are defined culturally and/or linguistically, that are in small ways and big currently trying to secede from the countries they are now part of. Now here’s another way in which perhaps the Annihilation of Nations could be brought about. It seems that Europe is busy breaking up, into hundreds of nationalist/separatist/regional divisions. Mostly in response to the absurd and destructive policies of the European Union. Yeah. I was having this discussion with a friend yesterday as we were visiting one of Italy’s meticulously reconstructed medieval hill towns. Full of churches and amazing art and fantastic medieval architecture… and tourists. The town, in order to survive, had turned itself int a theme park of itself. It was working quite well, and was obviously remunerative, (and as we were there on a Sunday I’m happy to report that the gorgeous medieval/Baroque church was packed to standing room only for Mass… with tambourines…) but the problem with a tourist economy is that it is essentially parasitical. It lives off it’s own past, and the daydreams of people who come there for a mirage, a facade. And that is the best choice you’ve got in this country. The hill towns that are further off the trainlines where no one has invested millions to spruce them up are essentially abandoned. Of course contraception sealed the coffin, but it started with the Risorgimento and the viciously anti-agricultural, anti-traditional laws put in place by the freemasonic secularists to “modernize” the economy that resulted in forcing the Italians out of their ancestral villages and way of life. Now the hill towns you see on the road on the way to Norcia are abandoned. Pretty from a distance, but no one is ever going to live in them again. When I was a kid growing up in Victoria, the town did this thing of people dressing up on Victoria Day. There were companies who would rent you a costume (mostly of rather dubious historical authenticity), and you just got dressed up, went to the Victoria Day Parade, then promenaded up and down in front of the Parliament Buildings on the water front, or went to the Empress for Afternoon Tea, or took a stroll up Dallas Road to the park for a concert in the bandshell. The whole town got into it. I had always understood Our Lady’s statement about Portugal retaining the faith as meaning that the Church in many or all other nations would apostatize and become heretical. As for nations being annihilated, consider the Armenians. That happened only a few years before Fatima. Finno-Canadian myself, but as you know full well, Hilary, your homeland still takes its historical roots very seriously. I mean – Happy Victoria Day – I shall light a candle firecracker for you tomorrow night. I was wondering about contraception even more than abortion in regard the annihilation of nations. So many countries are below replacement level that, mathematically, they are done. But I also see multinational corporations as part of the mix–if they write laws for nations and if every aspect of life is geared toward profit for these borderless entities, well, I think we are already there. My 2 cents, anyway. What chantgirl and Michael Dowd said. Freemasonry begat socialism, which begat today’s New World Order secular-progressivism. It all goes back to the root of the whole problem – atheism. You would think that after the destruction of World War II and the constant threat of destruction during the cold war that the people of Western Europe would have converted back into faithful Catholics. And yet, the exact opposite happened. They got more secular, lazier (i.e. mandated 35 hour workweeks and now it’s against the law to email work to people in France I believe) and more selfish (i.e. the drop in birthrates and the increase in contraception and abortion). So why again should God not be angry with his flock of very stupid sheep? islam has already overtaken Europe, we just haven’t seen the official overthrow yet. Paris and most other cities in France are surrounded by dingy suburbs, populated by muslims. Flashpoints are happening more and more and it’s naive and foolish to think that these cities can survive when they’re surrounded by forces who never had any intention of assimilating into a secular-progressive type of society. So yes, islam has already annihilated nations and there’s no way now to contain it from spreading. I personally believe though that at some point, the muslims will be converted through the Immaculate Heart of Mary much like the Aztec people were after Guadeloupe. What I don’t know is how the chastisement from Russia will play into all of this. Oh and chantgirl, you are absolutely right about what Soros is up to. Here in Philadelphia, he very-well funded a radical, pro-Occupy, pro-BLM guy running in the democrat primary for District Attorney. Unfortunately, this guy won and in a city where democrats outnumber republicans by 7 to 1, we will soon have a Soros puppet in a very dangerous position here. The instruments of nation annihilation are Islam and atheism both coming as a result of the Catholic Church’s decision to be more concerned about geopolitics than the conversion of the world to Christ. In other words, this entire situation need not have taken place. Unfortunately, it has and there appears little we can do except to pray for more time and a truly Catholic Pope. Actually, both the Russian Orthodox Church and the Russian government are now trying to put a stop to the massive number of abortions in Russia. This may be enlightened self-interest, since they will lose the demographic war unless Russians let more of their children live, but whatever it is, they are trying to end this Soviet-era practice and are also trying to encourage marriage. I was in Russia last fall and I was impressed by how far they have come from where they were at the time of the collapse of Communism. The Russians have always had a mystical, almost messianic concept of their country. This can be a good thing or a bad thing, depending. And sometimes it’s a little heavy going for a non-Russian, because they wax so lyrical about “the Russian soul,” etc. In this connection, they really respected BXVI, because they felt he recognized and respected them. Also, among the Orthodox clergy, famous for hating Catholics, BXVI had a lot of credibility because of his attitude towards the liturgy, which is of paramount importance to the Orthodox. Again, I don’t know how all of this fits into the context of Fatima, but Russia is somehow of great importance in this drama that is being played out before us on so many stages right now. Annihilation could mean abortion, spiritual demise, loss of sovereignty, or physical destruction. We are already seeing the abortion, spiritual demise, and loss of sovereignty. I have a feeling in time we will see the physical manifestation of the unseen reality- like Jesus promised the physical destruction of Jerusalem as a manifestation of its spiritual crime of rejecting the Messiah. However, I have to also wonder if Our Lady’s words at Fatima are also a warning about Islam. The link between the history of the town of Fatima and her words “in Portugal the faith will be preserved” makes me wonder if she is not also predicting Islam’s takeover of many European countries. Perhaps Portugal will not be overrun by Islam and many other nations will be. Clearly, the errors of Russia are using Islam as a plague to weaken the west in order to bring about the death of Christianity and usher in a new era of totalitarianism. The fact that Europe is becoming more localized is part of this process. When societal and faith and family structures are broken down, the individual is much more vulnerable to the power of the state. Here in America, the Soros machine is going at ramming speed right now. The left is so furious at its loss in the last election that it will do anything to break down order. Even though Trump’s administration is, at the most, a speed bump on the way over the cliff, the left will not tolerate any loss of forward momentum. I predict that if they cannot remove Trump or or force him to capitulate, that they will resort to violence or some sort of manufactured black swan event. The left only cares about power, and it will not relinquish the ground it has taken without an ugly fight. In Europe, it will be interesting to see if the Left can successfully control the plague of Islam it has unleashed. And who knows when the physical chastisement will come, but I do believe it will come. Since the warnings of Fatima and Akita, mankind has not repented. If anything, we are rushing to our destruction. … and Eastern Europeans as a whole are very much oppose to the “LGBT” lies. First, many of them lived under Communism for a long long time and recognize the propaganda or what it is – particularly the emotional and intellectual thuggery we politely term “political correctness” used to enforce compliance. They know it was Lenin that invented the concept, and they remember quite well what sort of fellow he was. Second, many of these nations survived the Communist oppression by aggressively retaining their religion, and they recognize the thing as a scam and an assault on the Church. This is certainly the case in little places we rarely hear about like Belarus. No nation has more abortions per capita than Russia. She’s at the top of that bloodied stack of bodies. China does more overall, but per woman, Russia is king of the slaughter. Some interesting thoughts there, Hilary. 50 million people! That’s more than 2 Australias! If the USA breaks up into anything it would be bad for virtually everybody. Isabel just when I think Russia is in that spot, that they have suddenly become a more Christian nation, I am reminded that they are the abortion capital of the world, give or take a few precious lives. Almost no nation has more abortions than Russia. As a Cold War baby as well, it is bizarre to me to have Russia be in anything other than the category of scary Communist nations. This is what I was raised on, we were told as children that nuclear attacks could happen. We went into our shelters in schools for drills. So these days are just strange for that reason as well, because it seems that Russia has become resistant to some of the same things that torment us, like the LGBT movement. I have never been to Europe. It’s not looking like I will ever go. But I lament the loss of identity they are experiencing and going to experience as Europe becomes Islamicized. Gone will be all the cultural markers of the individual nations, all the charming things that were part of each nation, so identifiable to us all. And where will all the blonde Swedes go? The Irish redheads? Only white people are not allowed to hold such characteristics dear. Absurd. Each people has to decide for themselves what is worth fighting for. It does not appear anyone in Europe has the will to survive. France just elected a globalist croissant. We count them as gone. We’re sad about it, as we are about Italy, Germany, etc. So what did Our Lady mean, and did she mean abortion. It is a good question, and I have no idea. I would tend to take her more literally, tend to think she would not use a euphemism, but direct language. I would tend to think annihilation means just that. One of the truly strange things now is that it is actually Russia that seems to be the only state willing to stand up for Christians and Christendom. Russia and a couple of the other former Soviet bloc states, such as Hungary, that is. So maybe Our Lady has yet another plan in mind with regard to Russia. I read a very interesting article today by Antonio Socci regarding the resignation of BXVI and its connection with his desire to enter into some kind of pro-Christian alliance with the Moscow Patriarchate. Socci pointed out that Obama and Clinton were very angered by this because Obama supported the Muslim Brotherhood and hated Russia for supporting the West and Christians – and by extension, hated BXVI. Curiously, there were a lot of strange things happening on the international financial level that put a lot of pressure on BXVI, the final one of which was the Vatican’s unexplained and arbitrary ejection from the SWIFT banking system that day and its restoration to the system immediately after the resignation. It would not surprise me in the least to find another meaning behind Our Lady’s words at Fatima that somehow had a bearing on this situation. It would seem that Our Lady’s warning of annihilation of nations is to be taken as a chastisement, something bad, to be avoided. But would annihilation of nations in the sense of Europe (or the USA for that matter) breaking up into smaller countries be a bad thing? Or am I missing your point (the sorofication is the bad thing, the breaking up a good thing – the “re-nationalization” of nations)?